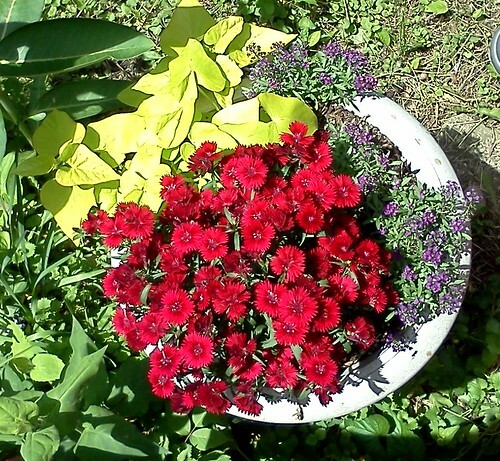 Deb's Cup of Tea: Color! The flowers by the deck stairs are doing well. Some of the ones on the deck were sitting in soggy soil thanks to the inches of rain we've received in the last 3 weeks. I'm hoping I don't lose one of the geraniums due to this. I must have relieved the pot of a good quarter cup of water. A reasonably dry weekend past helped. Any yet, the overwintered dianthus has exploded in flowers and color. The sweet potato vines are growing like the weeds in the yard and I've had to reposition several of the pots so they don't shade some other flowers. I deadheaded the marigolds and the zinnias, so, in another week, those pots will be riots of color. That is always my goal in flower planting. I want color, lots of color. It makes me happy. The day can be long and tiring, but, when I come home and pass by this container, my spirits are cheered.